Furniture, appliances, and antiques constitute a major chunk of household belongings. And without doubt, one spends a major share of income to possess those. But when it’s time to move – whether across the street or interstate – the fear of damaged and broken furniture pieces rips you apart. This is where professional furniture movers in Melbourne prove helpful and effective. Skilled and trained to move every furniture item with competence, the furniture movers ensure that your prized possessions remain as good as new, even after a strenuous move. Dismantle Furniture – It’s best to move big furniture items after dismantling them. This not only safeguards the furniture item but also helps you save cost. As moving cost is essentially calculated on the space occupied and the size of the moving truck dismantled furniture will fit up in a smaller area, helping you save big bucks. Pack Deftly – Loading of furniture entails picking, dragging and sliding them until they are safely placed in the moving truck. Equipped with the right materials and equipment, we pack and move furniture to place them safely in the truck. Our flawless packing and wrapping ensure utmost security and no risk of chipping and scratches during transit. Coding – Dismantled furniture has the nuts and screws that have to be placed carefully. Losing out on these small parts may render the furniture useless. Also, as a different set of the team will unload and reassemble furniture after an interstate move, it’s important that a standardized pattern is followed. Professional furniture movers in Melbourne are trained to do just that! Reassemble Furniture – Following the coding pattern, the furniture movers’ team at the destination city will rearrange and reassemble furniture. Experts in the job, we ensure that the pieces are seamlessly fixed together and put at the right place. 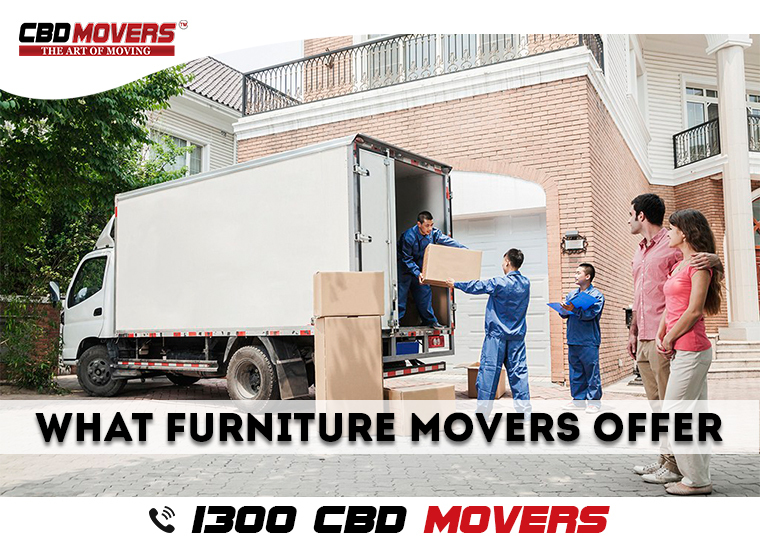 If you too are looking for experts to help you move your household belongings and furniture, CBD Movers is the undisputed choice. Besides being competent furniture movers Melbourne, we are expert packers and movers in Melbourne and provide comprehensive house moving services. Call us at 1300 223 668 for customized solutions and affordable deals.